No-one can say I don't look after my man! I didn't do much for Dias de los Muertos this year, except for the one most important thing. My Opa (grandfather) was diagnosed with lung cancer in April this year, and passed away in July. 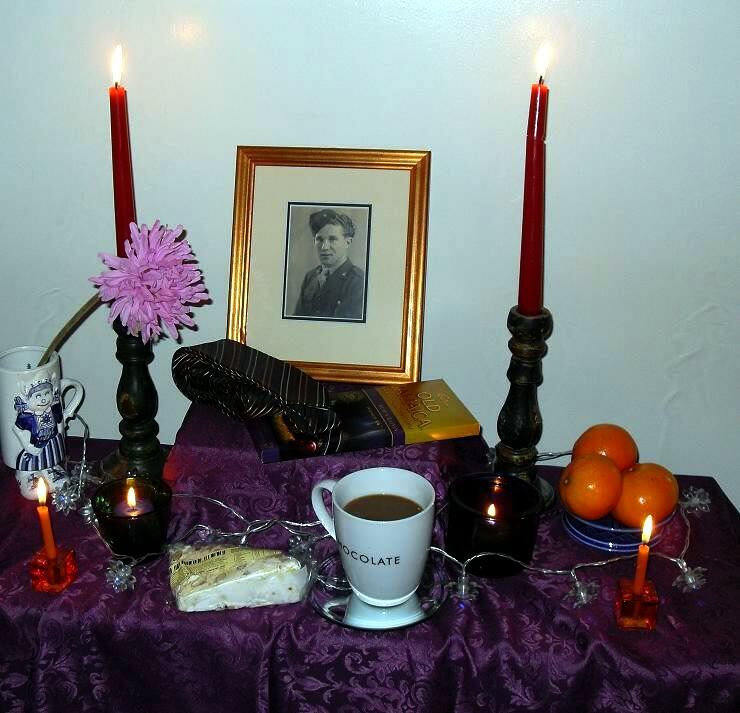 I dedicated an altar to him. 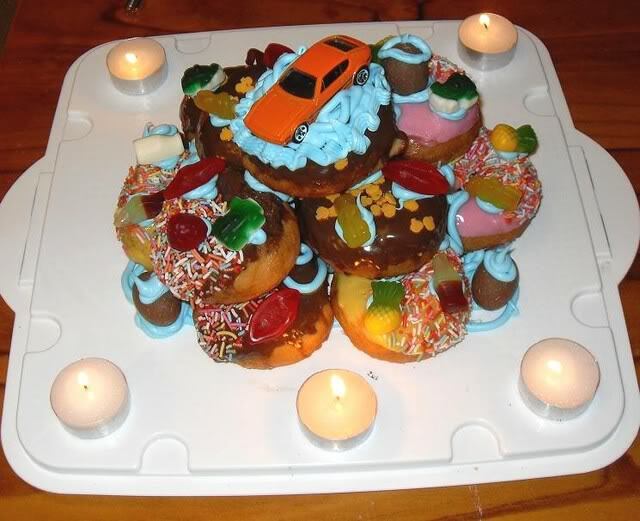 I decorated it with some of his favourite foods, and bought him a tie because he liked to dress nicely. This year has been such a strange year. My Opa is the first person I've known well who has died. I'm 35 years old. I have a feeling it's quite rare to be so old when that happens to a person for the first time. I've noticed some changes in myself since he passed. Perhaps I'll talk about it a little sometime soon. I scrounged through my fabric stash and I only had one small piece of gingham! How could this be?? But it was enough to make a small project to start off with. I wanted to lay out the design beforehand, but where to get a template from? I had a brainwave and printed out some downloadable gingham scrapbooking paper from the pastels section of this site here. I printed it out in black-and-white. I had to enlarge it by 200% so I didn't go cross-eyed, but then it was perfect. 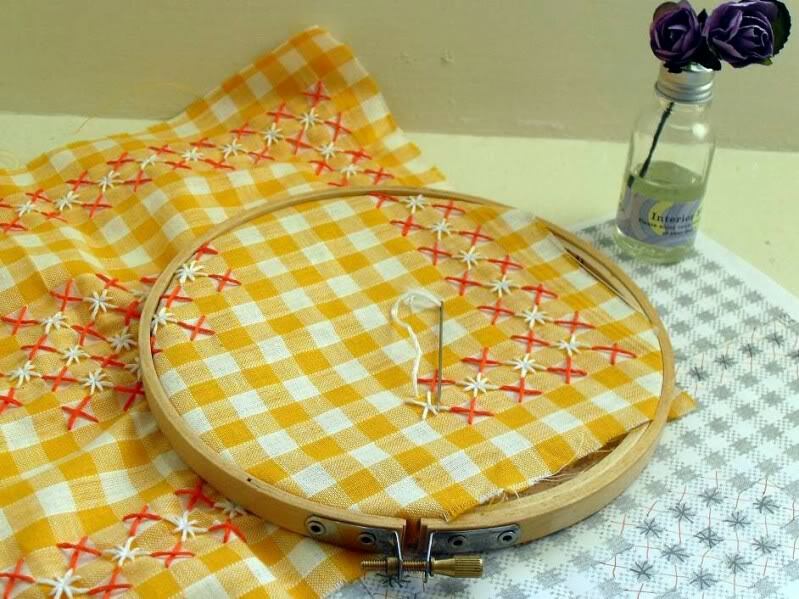 Most gingham embroidery uses white thread as the main colour, sometimes with a contrast colour as well. I chose orange. I designed it during my lunch break at work. I decided to use the full thickness of the 6-strand embroidery thread, because the squares of the gingham are so large (either 8mm or 10mm, I believe). Using the full thickness means that much more thread is used up in one go. I was worried at one point that I'd run out of thread, but I think I'll be OK. I've worked on it like an embroidery-crazy woman so far, and I'm nearly finished already! Then all I will have to do is sew on a calico backing and it'll be done. I already know where I want to put it. And never fear, I've ordered some more gingham in 3 different colours from ebay for future projects. I'm starting to think I'll need more white thread, too. Lots more!